After the death of her father, eighteen-year-old Marisa’s life is on the verge of imploding. She seeks comfort on her daily ride in the woods of Gold Hill but when a mysterious lightning storm suddenly strikes, Marisa is hurled into the ancient alternate dimension of Carnelia. There she meets the arrogant but attractive nobleman, Darian Fiore. With no hope of returning home on her own, Marisa must join Darian on a risky mission to negotiate peace with his cousin and archenemy, Savino da Roca. As she struggles to survive a world teeming with monsters, maniacs and medieval knights, Marisa sees a softer side of Darian and begins to fall in love. But when she discovers he is locked into an arranged marriage, her heart shatters. After Savino falls for her charms and demands her hand in marriage in exchange for peace, Marisa is faced with an impossible choice: marry the enemy of the man she loves or betray them both and become the catalyst for a bloody war. Book 1 of the The Carnelian Legacy series, romantic fantasy for all ages. Imagine this: you’ve just lost your father, you’re about to turn 18, and you’re looking for some kind of purpose in your life, when you’re suddenly swept into a fantastical parallel universe where everyone calls you “Milady”! Not only would you have to deal with the sudden shock of being a fish-out-of-water, you’ll have to survive a web of intrigue, romance, and impending war — with YOU at the center of it all. Gigantic Cast: I love big casts and this book delivers. From Marisa’s “normal” family and friends on Earth to the knights, paladins, and mistresses who become her “surrogate” family in Carnelia, there are lots of characters that you will meet and get to know better. Though the love-triangle of Marisa, Darian, and Savino is the focus, the supporting cast will make you laugh, smile, and sometimes cringe! Mystery and Intrigue: This book is teeming with multi-layered mysteries and royal intrigue, both of which Marisa has to solve if she’s going to get back home. First: how to get back home? Luckily, several characters are already hard at work on the mystery of the lightning at Gold Hill and the bonds that connect the two worlds. Second: who will take the Carnelian throne? Darian and Savino aren’t just vying for Marisa’s heart, they both see themselves as king. But succession ain’t easy, and Marisa will have to dig into Carnelia’s foggy past in order to help influence its future. 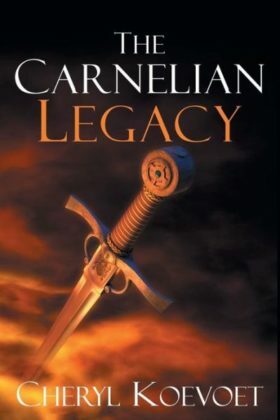 I’d highly recommend The Carnelian Legacy to anyone who enjoys a good fish-out-of-water tale! Take the fun and fantasy of Harry Potter, combine it with the romantic elements from Twilight, and this is what you’ll get. Enjoy!